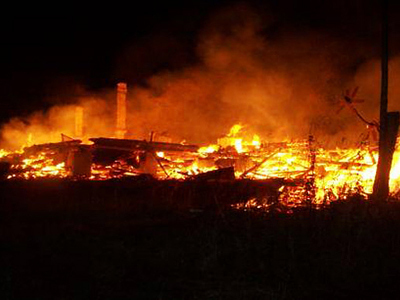 Four people have died in a retirement home fire in the Kostroma Region of Central Russia. Officials believe one of the smoking inhabitants is to blame for the tragedy. The fire started around midnight in a small town of Tikhon on October 8 in a building meant for temporary occupation.The building housed 13 people at the time and one member of the medical personnel. Ten people have been evacuated from the fire. All of them have been taken to the nearest hospital for treatment. According to a preliminary police statement, the fire started in a room that was used by pensioners for smoking. A criminal investigation has been launched. However, which of the nine men with a smoking habit could have been responsible for the fire is still unknown. A nurse was the first to notice the fire and began the evacuation. The elderly people have been woken up by the fire alarm and that helped them to escape the building in time. Two fire brigades arrived promptly at the site, however they were unable to save everyone. The one-story wooden structure burned down to the ground. Earlier this year during an inspection the authorities have found several fire safety violations. This is by no means the first such incident in Russia. The fire safety in retirement homes has been under scrutiny from the governmental officials for several years now after series of deadly fires. In the past several years there have been fires at nursing homes and hospitals across Russia, claiming dozens of lives. A similar case happened in 2009 in Russia’s northern republic of Komi. A retirement home burned down claiming the lives of 23 elderly people. Just as in Tikhon, the fire started in the smoking room and quickly spread throughout the building.